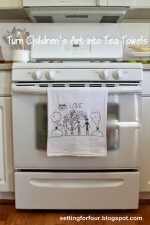 Make these pretty DIY Ribbon Trimmed Tea Towels to decorate your kitchen – so quick and easy to make. 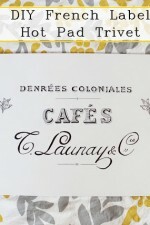 These gorgeous kitchen towels are a great gift idea too! 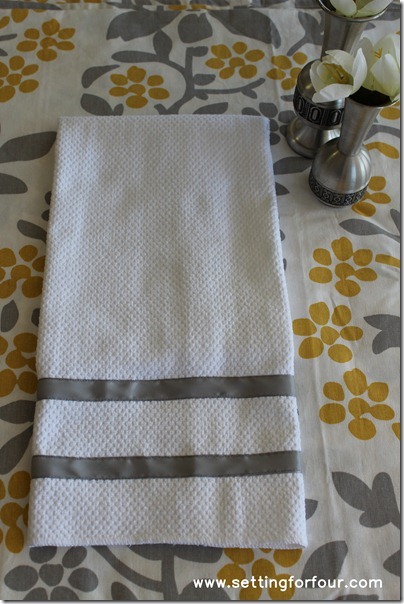 Today I’m sharing a tutorial on my latest DIY project for the kitchen – Ribbon Trimmed Kitchen Towels! 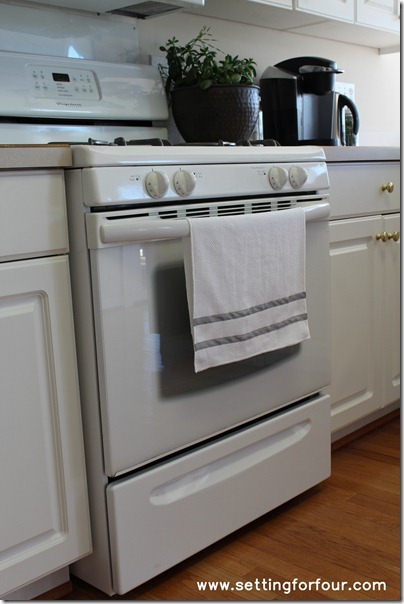 I used a gorgeous French Gray ribbon but you can use any color you want that goes with your kitchen colors! I just love how the stripes turned out! Don’t worry if you’re not an experienced sewer! This tutorial is very easy!!! – roll of satin ribbon (I used a Gray color but you can use whatever color you like). Wash and dry towels according to instructions on package. Cut the end of the ribbon straight across. The ribbon has a shiny side and a matte side. I sewed the ribbon onto the towel so that the matte side faces out. Fold 1/4 inch of the ribbon’s raw edge under so that the matte side faces out. Pin the ribbon in 3 places along the towel. Cut the other end of the ribbon about 1.5 inches longer than the width of the towel. The ribbon will tend to ‘shorten’ as you sew so if you cut the ribbon exactly to the width of the towel, the ribbon will be too short. Starting at the end of the ribbon that is folded under, begin to sew close to the edge of the ribbon. (Ignore the green painters tape. I put it there for a previous sewing project as a 2 inch marking guide). Remove pins as you sew. 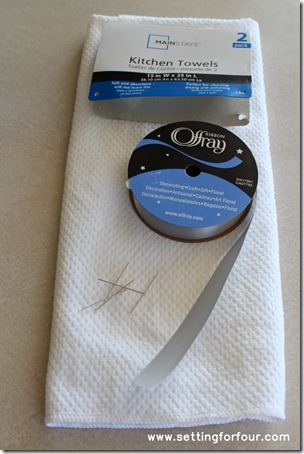 Once the other end of the ribbon is 1/2 inch from the needle, fold the edge under. This will make sure you have the exact length of ribbon needed. 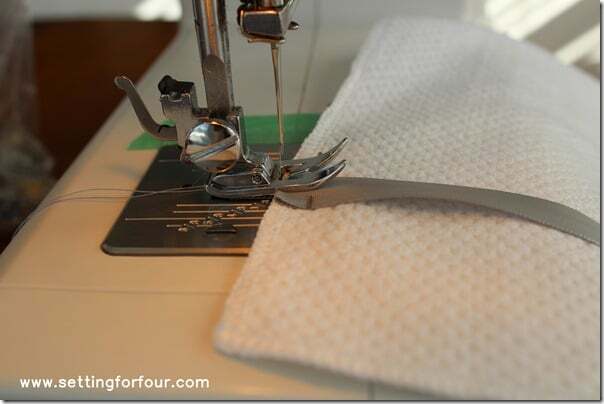 Continue to sew the other 3 sides of the ribbon so that you end up where you began sewing. Sew a second row of ribbon 2 inches higher than the last row. 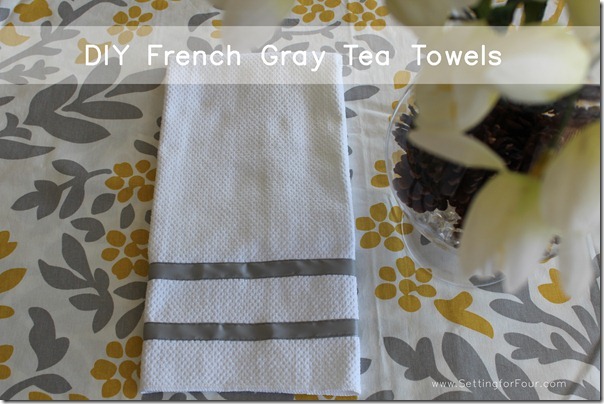 French Gray trimmed kitchen towels – a quick and inexpensive DIY to perk up your kitchen. 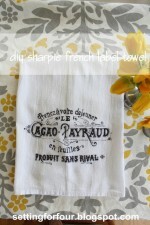 DIY French Label Sharpie Towel – Great Gift Idea! 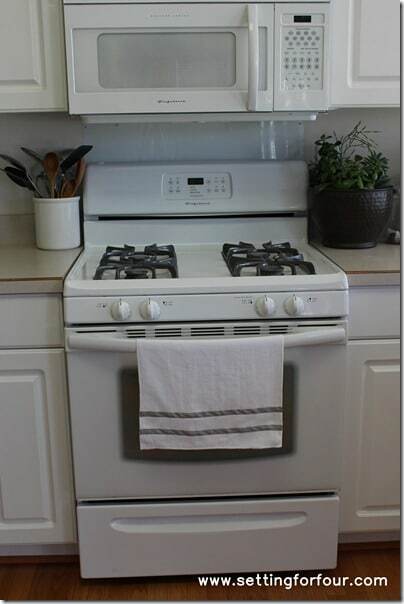 Yes, Smudge Proof Stainless Steel really does exist! 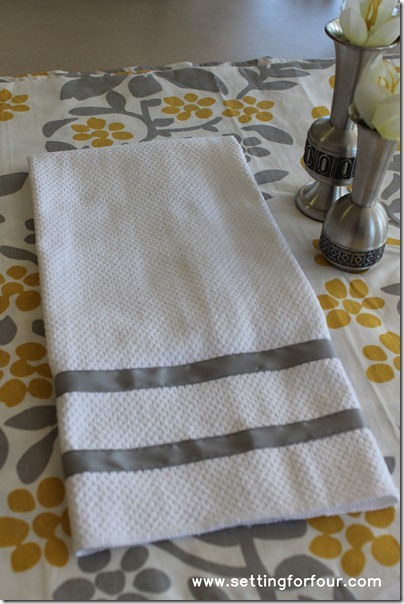 DIY Sharpie French Label Towel – Great Gift Idea! Thanks for visiting my blog, Tara! Glad you liked my DIY!! 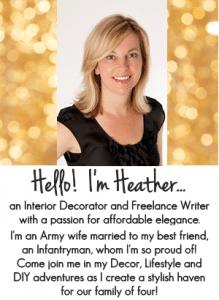 Thank you for the invite to your link party – I will be there! Thanks for your kind comments! And becoming a follower too!! Yes I will follow your blog! Very cute! Isn’t it great when something so simple makes such a change? Love it with your tablecloth. Thanks for your sweet comments Sonya! Yes – this was a very easy project. These towels are so soft and absorbent. I will be making more! Hi Kate! Thanks for visiting! 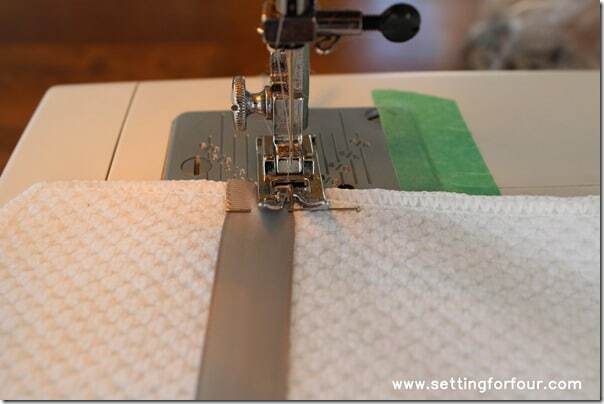 Maybe you could borrow a sewing machine from a friend or pick one up through Craigslist cheap…they are pretty easy to use once you learn how to thread the machine and the bobbin. 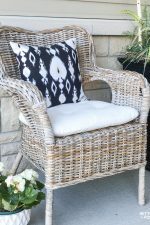 I took an inexpensive morning class at a local fabric shop to learn how to thread the machine, wind a bobbin and basic sewing techniques…Then you can make your curtains, and pillow covers for your home too. You can do it!!!! So cute! 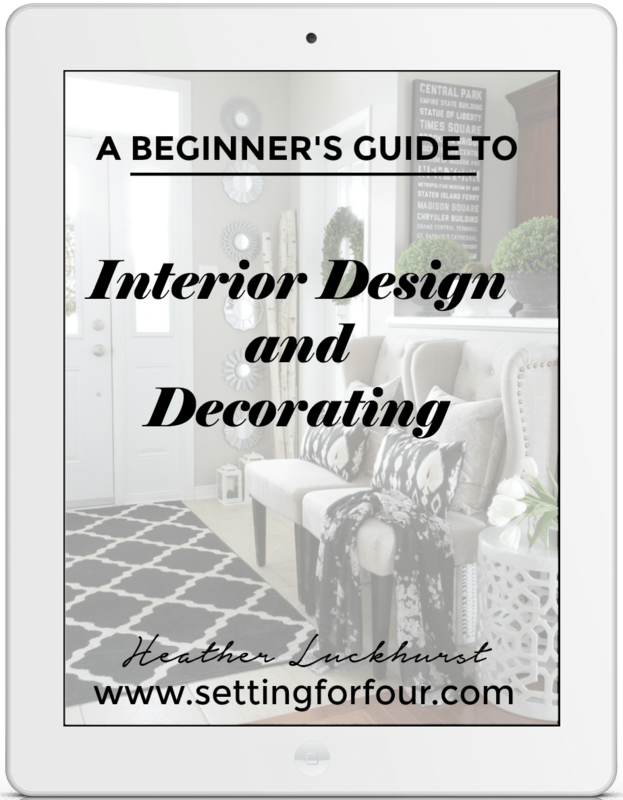 I love the gray…I’m all about adding gray into decor as well. My favorite combo is the gray and yellow like your lovely tabelcloth! Great sewing job! Thanks Meg – I love gray and yellow too. Especially for spring! So simple and so elegant! Love the way it turned out! Great job! Thanks Lyuba for the compliments! It is a very easy DIY project – I am making more for gifts! Thanks Polly!! I was surprised how easy they are to make! Thank you for your sweet comment!! Wow! Thanks Roeshel for pinning my DIY on your pinboard. Will be by to visit it for more inspiration! Stopping by Nifty Thrifty. So cute, love how the ribbon add the touch of elegance to the towel. 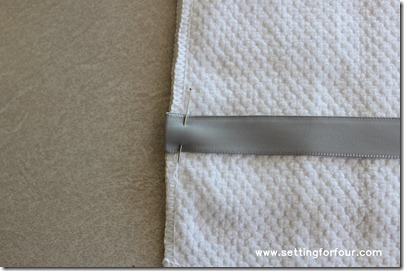 I love to sew and this is a really quick and easy project. Thanks for showing us how to “copy”. My fingers are crossed that you will share this at Sunday’s Best going on now. Thanks Cathy! I just linked up to your Sunday’s Best Party, appreciate the invite!! 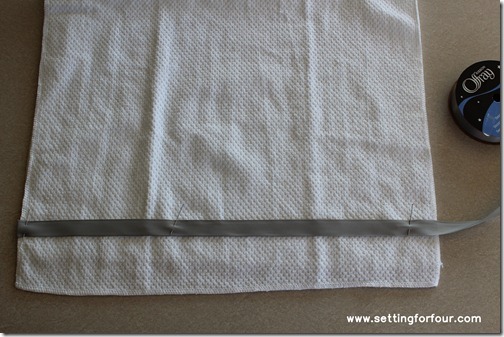 This project is very easy and quick, I just made another towel yesterday!! I have got to do this; so pretty!!! Hi Brooke!! It is pretty isn’t it! 🙂 AND easy and cheap!! Thanks for visiting! Super cute, Heather. Love it! So easy and a cheap way to add color. I may have to try this. Hope you do try it, Andrea! What a difference a simple gray ribbon makes! Love them. Thanks for linking up to the Share the Love Wednesday link party at Very Merry Vintage Style! I linked up to your party, Marissa! Thanks so much for following me! Your towels turned out great! I wouldn’t have even known that the stripes were homemade. They don’t look too hard to do either, I think I could even do it, even though I am not much of a sewer. Thanks for stopping by my blog. I am now following you! Just wanted to say thanks for sharing, really love these towels. So happy to see you linked with Sunday’s Best and shared your creative inspiration. Hope to see you next week! Thanks for visiting and your lovely comments on my post! Thanks! I just finished making another one and am making more for hostess gifts! Thanks for visiting my blog! You did a good job… they turned out great! I saw this on Pinterest, I didn’t realize it was yours! Love the idea and will be stealing it at some point! what a great craft!!! so creative!! and your towels look Great!! I love your towels. I am actually doing grey and yellow in my bedroom. It is such a fun color combo! That’s very cool, I think I will make some. Thank you. I love that it is a simple touch that adds so much!! 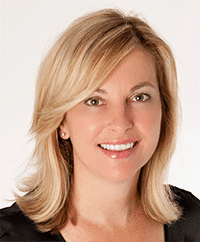 Thanks so much for sharing and I am a new follower! Thanks so much for following and glad you like these towels! I have been searching for this tablecloth for forever, if you’re willing to sell it I would love to purchase it from you. 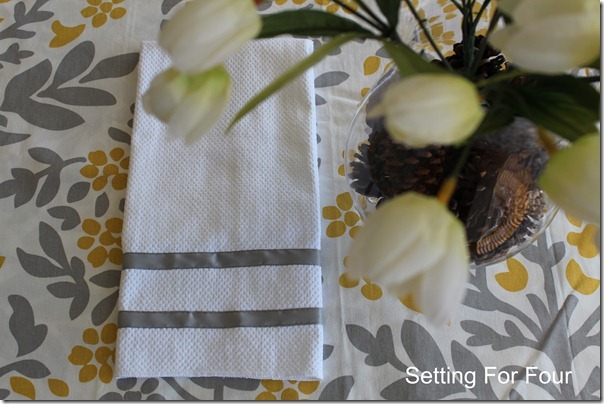 Ncolet – I am not selling my tablecloth, I really love it! Perhaps if you keep checking ebay??? Hopefully you will find it soon!